Day 1 – Following the Quinoa Trail! 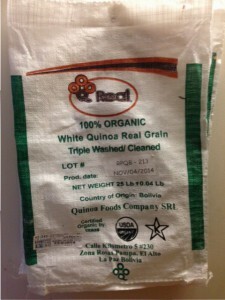 Quinoa sack from the Brattleboro Food Co-op. Here I am at the Brattleboro Food Coop – our local food coop which has been selling organic Bolivian quinoa in bulk and as a packaged good for over 10 years. And here is a sack of organic quinoa from Bolivia that in May 2015 was poured into a bin for bulk sales to consumers (retail). 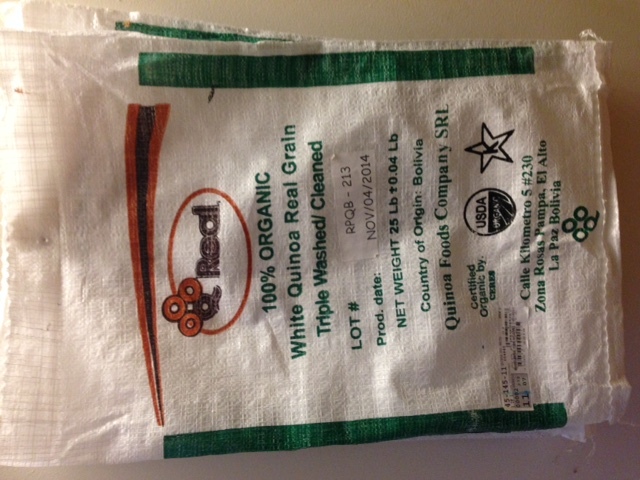 Starting July 1st, I will travel to Bolivia with the empty quinoa sack from the Brattleboro Food Co-op, looking to find the producers who filled it back in November 2014 and trace the value chain of this ancient grain. How did it get here, by whom, at what cost? Where are the women in this and how are they effected as world demand and value of this native grain grows? 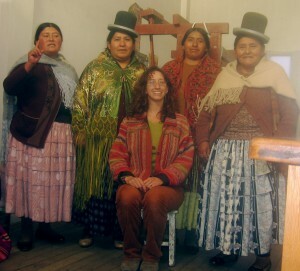 And what is the future for Bolivia – the native home of hand harvested, small scale quinoa production? Come join me on this 70 day journey! This is me in 2010, when I was studying the effect of Fair Trade knitting and weaving on Bolivian women for my doctoral thesis. 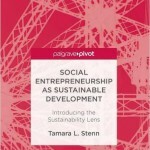 The results of this study and another one in 2012 that looked at the effect of Fair Trade coffee growing on Bolivian women is found in my latest book.